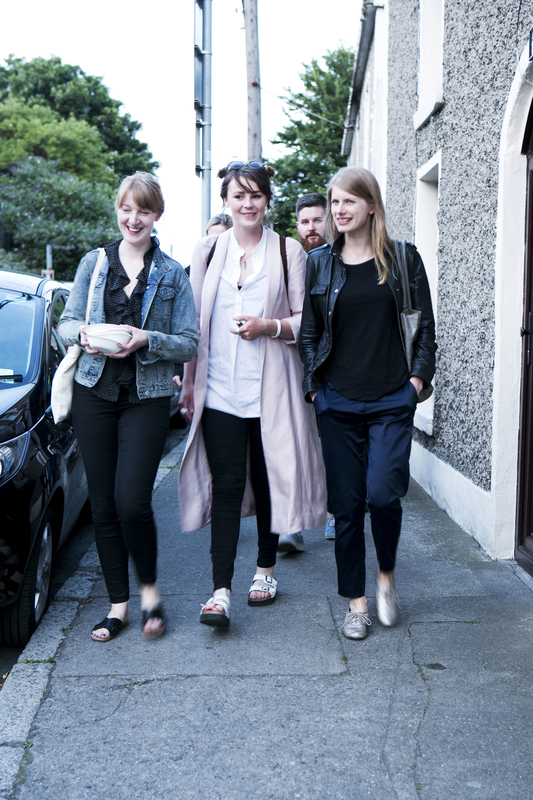 On 8 July 2015, Household collective held a collaborative dinner at IMMA to mark the end of the exhibition More Than One Maker. Household collective is a Belfast-based team of five people who organise art projects that encourage audiences to re-think the way in which they interact with art and to experience new art in unrestricted, non-commercial contexts. They also support artists, writers and creators and look to organise projects that benefit them as well as the public. Below, they tell us about how the event came to be and how the evening played out. 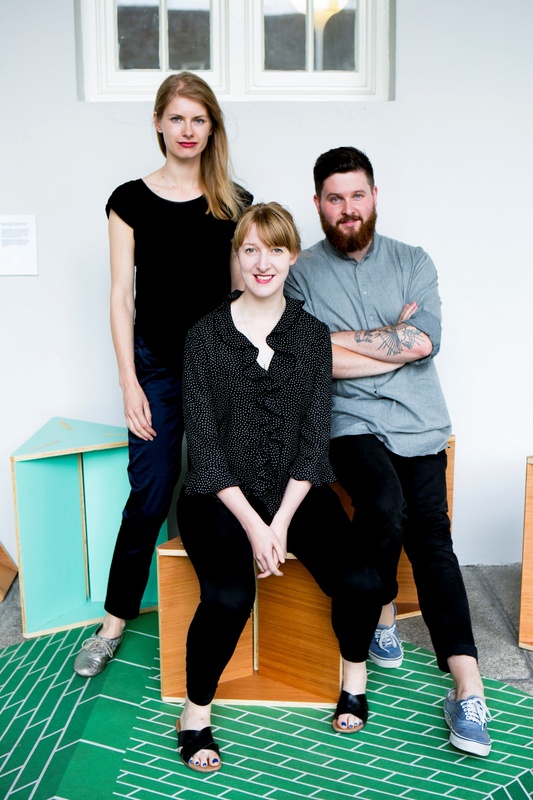 We were delighted to receive the invitation from Janice Hough and Sophie Byrne, curators of the exhibition More Than One Maker, to curate a closing event for IMMA’s Project Spaces on Wednesday 8th July 2015. 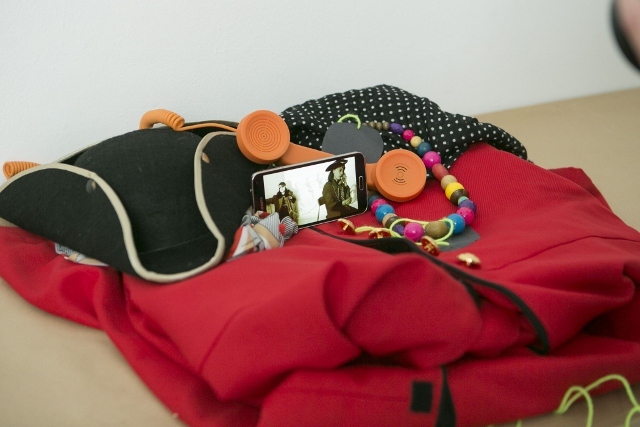 The focus of the exhibition: ‘kinship, agency, utopianism, peer to peer learning and an appreciation for collaborative networks and vision’, are central themes to the projects that we, the five members of Household collective (Sighle Bhreathnach-Cashell, Eoin Dara, Ciara Hickey, Alissa Kleist and Kim McAleese) organise. 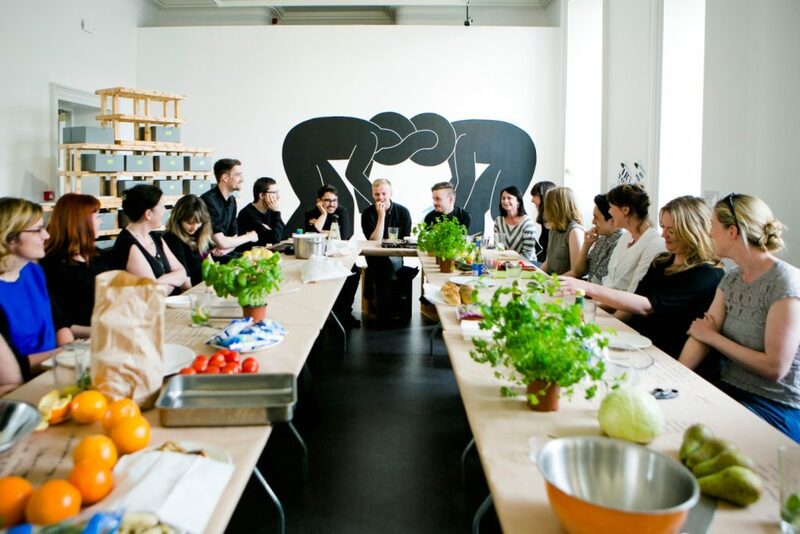 Our proposal – to organise a collaborative dinner titled Making a Meal of It – was a continuation of a previous event we hosted at the Belfast based gallery PS2 in April 2015. There, the five of us had presented collective and individual research about artist led housing initiatives, utopian self-built cities, conditions of hospitality, art making in the civic realm, authorised and unauthorised activity and the sharing of a meal as a curatorial approach. Attended by local artists and creative practitioners, it was an afternoon that allowed us to successfully share and discuss our interests with peers, so we were keen to replicate this elsewhere. Presenting Making a Meal of It for IMMA provided a practical framework for collective activity. Guests prepared ingredients together in order to construct a number of dishes that were to form a shared meal. 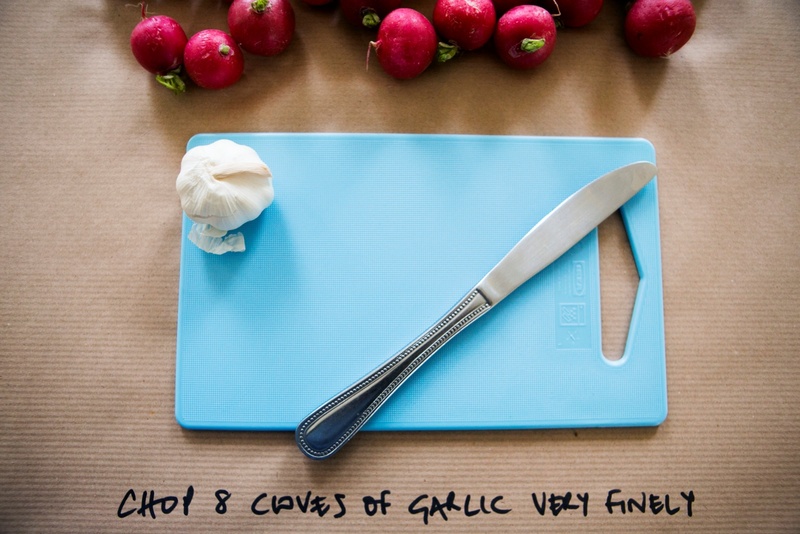 A range of ingredients were sourced and placed on paper covered tables upon which individual actions, to realise and bring together a selection of recipes, where scripted. All 28 guests were encouraged to find a place at the table and once everyone was seated we introduced ourselves and invited everyone to follow suit. We explained some of Household’s objectives and discussed previous projects. The group was invited to begin preparing five dishes collectively, an action that served as an icebreaker for neighbouring guests not yet acquainted. 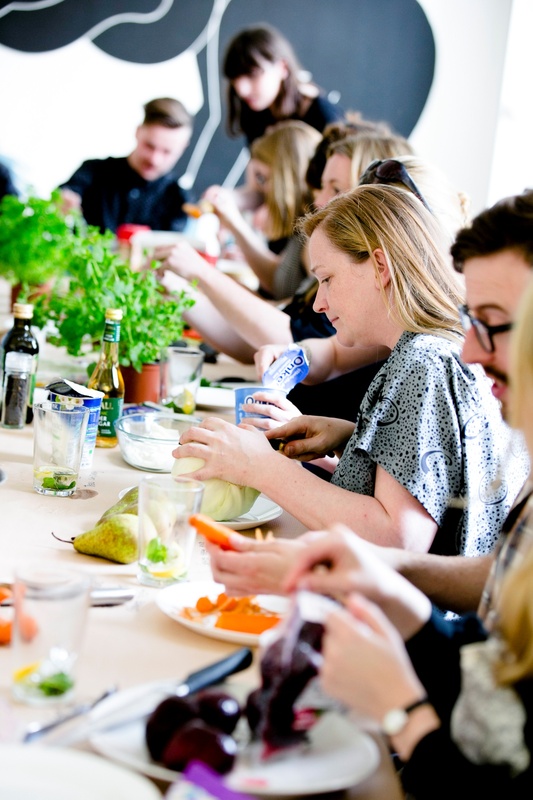 For many of us, making a meal together is evocative of childhood and the home; a nurturing and hospitable act that is tactile, sensory and emotive. Transposing this action into the white cube and completing it with familiar everyday tasks encourages audiences to re-evaluate their surroundings and actions in contrast to adjusting to ‘expected’ behaviors as visitors to galleries and museum. When preparation was finished, we shared the meal together, and aptly an open discussion about collaboration ensued. A couple of things were of note: firstly, that the discussion was not held between a few key individuals, but included everybody at the table. Conversation was readily exchanged between a large group of new acquaintances which felt inclusive and democratic – similar to a ‘dinner party’ experience in a domestic setting. Secondly, that these types of events are usually more organic and unpredictable than anticipated. Unlike the experience of a formal presentation or lecture, where the speakers lead while an audience spectates, dialogue flowed in and amongst various topics related to our subject matter. Room was also left for spontaneous and unplanned discussion. We focused on the types of language used to describe art projects that take place in public, the conditions of hospitality, the challenges faced by collective endeavors, as well as points of resistance and innovation. Our engaging guests, some of whom where exhibition participants, contributed their ideas, experiences, perspectives, observations and topics. This mix of lively conversation, ‘ingredients’ combined (we cannot deny ourselves one culinary metaphor!) to form an unpredictable, exciting and critical evening of conversation at IMMA. Closing time at IMMA was 10 O’clock, and as with most dinner parties, dessert is served later than expected. In anticipation of this, events moved to IMMA’s local, the Royal Oak, where Tiramisu was assembled with complements of a bottle of Tia Maria provided by the bar. Needless to say conversation continued until a second closing hour brought Making a Meal of It to an end. For upcoming projects and the latest news about Household Collective visit http://www.householdbelfast.co.uk.